It took me a while to get the correct determination, especially since I had never seen or heard of a Thelypodium species before. Leafing through picture books didn't help, since no one had its picture. Trying to key it out in my hotel room after I first saw this species on 5 September 2007 didn't work. I at first assumed it was a Brassicaceae, since that is what it looked like, but it wouldn't key out using the McDougall key. When I returned to the field on 6 September 2007, the first thing I did was count its stamens. 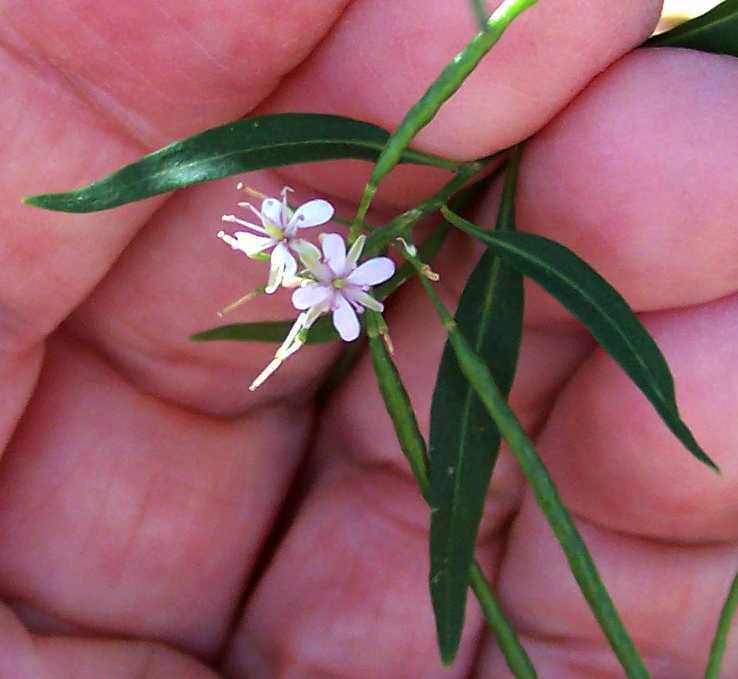 Unfortunately, for some reason, the first flower I examined had only five stamens, not the usual six for the Brassicaceae family. I spent some time in the field trying to key it with the McDougall key. That time was spent off in weird-family-land, those few families with four petals and five stamens, but I couldn't find a match. I then looked at a few more flowers, and found some with six stamens. At home, even when I tried Brassicaceae, it wouldn't key in McDougall since it doesn't fit three characteristics given in his key elements! 17a. Calyx closed or nearly so when the flower is in bloom, the sepals spreading, if at all, only at the tip. 18b. Petal blades not flat, either crisped, channeled or hood-shaped, little if any wider than the basal portion. 21b. Fruits not flattened or only slightly so. 23b. 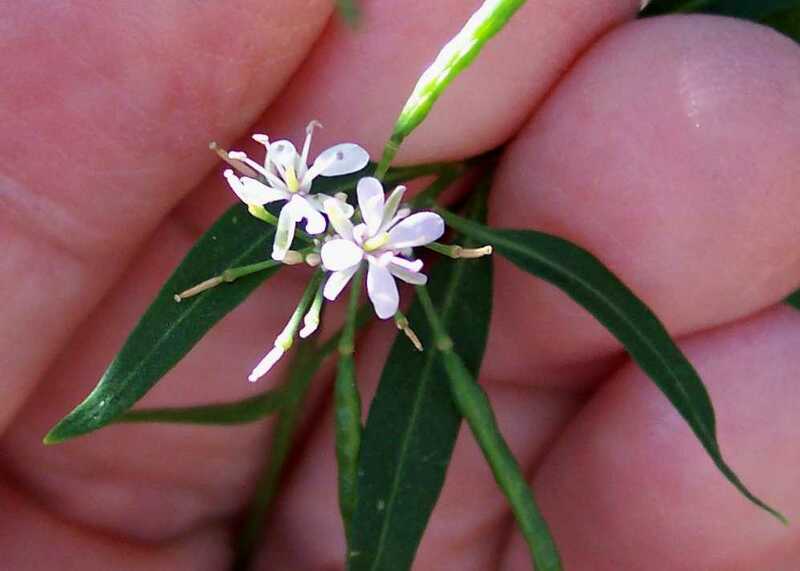 Petals white; stem leaves sessile. Note that key element 24b contradicts key element 17a, and that the sepals for T. wrightii are indeed spreading in their entirety, which McDougall correctly states in his description. 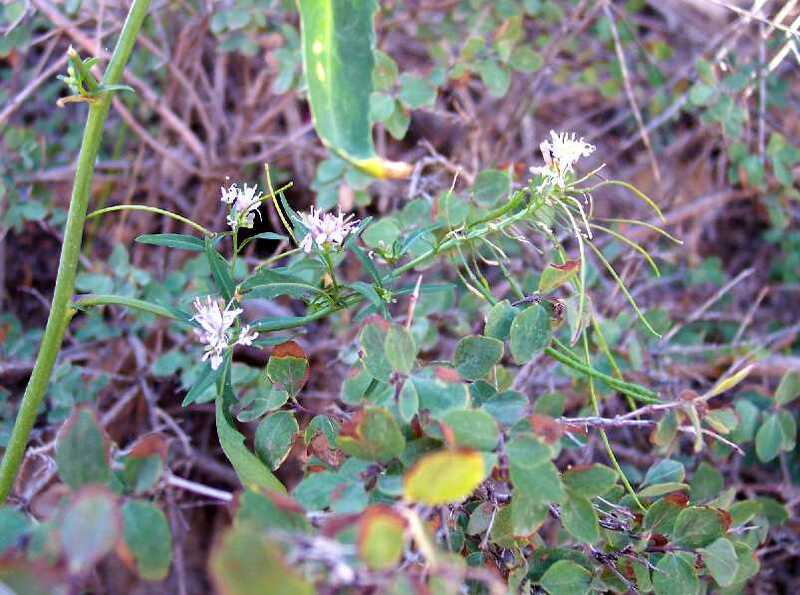 This is the only species of Thelypodium in Arizona with spreading sepals. 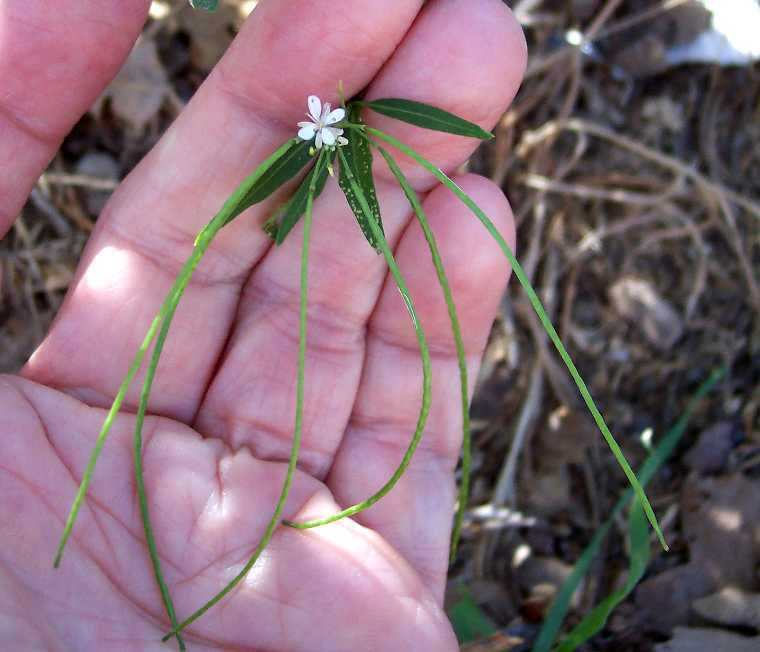 Also, even though many Thelypodium species do indeed have crisped petal blades, T. wrightii does not; it has flat petal blades. Finally, T. wrightii very clearly has petal blades that are wider than the basal portion, as do the other Thelypodium species with similar oblanceolate petals. After struggling with the determination for quite a while, I finally got the correct determination simply by looking at pictures online for every Brassicaceae species on the Grand Canyon plant list for the area around this trail. I of course then groaned at the three errors in the key. Finding such errors in a key is, by the way, not an unusual situation for any key. It is very difficult to make a good key that works for all species, due to the numerous exceptions to the rule found within each genus. By the way, it must not be unusual to find fewer than six stamens in these flowers. Look at the two flowers shown in closeup view in the bottom two pictures on this page. The relative position of the camera and the flowers is shifted slightly between the pictures, eliminating the possibility that any stamen is hidden from view in both pictures. The uppermost flower has only four stamens, and the lowermost flower has six stamens. Of course, I don't know whether the flower with only four stamens originally had six, and lost two as the flower aged, or if the flower only had four stamens originally. From a SEINet search, there are 13 vouchers of this species from the Coconino County portion of the Grand Canyon, including one from the famous Alice Eastwood in 1913 from this trail. Note that there may be additional vouchers at other herbaria not available through SEINet. 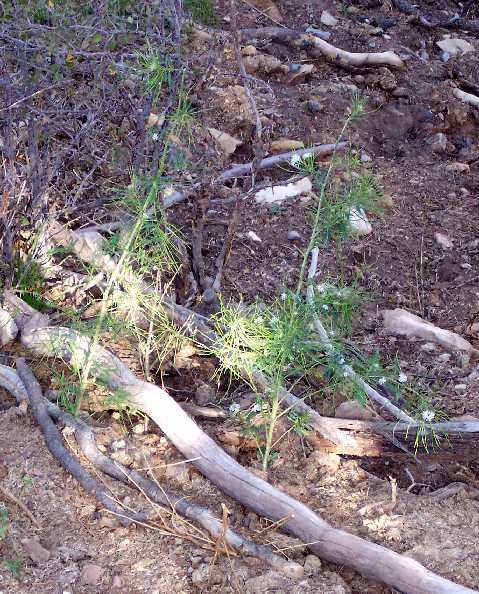 Number of plants along Trail: Only about 10 plants were found in 3 different locations in September 2007. More might be present in a wetter year.